The next bill before me, Introductory Number 856A sponsored by Council Members Duane, O'Donovan, Foster and six of their colleagues, would add, through the posting of an additional sign, the name "Big Apple Corner," on the southwest corner of West 54th Street and Broadway in Manhattan. John J. FitzGerald, born in 1893, was a horse-racing writer for The Morning Telegraph in the 1920's and was the first to popularize the term "The Big Apple." While on assignment in New Orleans, FitzGerald overheard African-American stablehands refer to New York City race-courses as "The Big Apple." FitzGerald loved the term so much that he named his racing column "Around The Big Apple." The title to the column became synonymous with the New York City racing scene. A decade later many jazz musicians began calling the City "The Big Apple" to refer to New York City (especially Harlem) as the jazz capital of the world. Soon the nickname became synonymous with New York City and its cultural diversity. In the early 1970's the name played an important role in reviving New York's tourist economy through a campaign led by the New York Convention and Visitors Bureau. Today the nickname "The Big Apple," which replaced "Fun City," is the international description of our city and is synonymous with the cultural and tourist attractions of New York City. Therefore, it is only fitting that the southwest corner of West 54th Street and Broadway, the corner on which John J. FitzGerald resided from 1934 to 1963, be designated "Big Apple Corner." I will first turn to the bill's sponsors and then to any other elected official who wishes to be heard with regard to this bill. "Apple Tours"—those then-ubiquitous red double-decker tourist buses—would build an office at Big Apple Corner on West 54th Street, next to the Ameritania Hotel. (I would not be paid for this or receive any credit.) The company had been cited for poorly maintained buses for many years, and one of its drivers had hit a pedestrian. The "Apple Tours" company is no longer in business. In late 2003, I wrote to various city council members and Mayor Michael Bloomberg that we were approaching the 80th anniversary of the February 1924 "Around the Big Apple" column that first identified the black stablehands. I asked that they finally be honored for Black History Month. I said also (again) that "Big Apple Corner" meant nothing standing by itself, and that a "Big Apple" should be added in the pavement. "Big Apple Corner" stands there today, unexplained, not honoring John J. Fitz Gerald, not honoring the stablehands, meaning nothing whatsoever to anyone without this secret decoder website. Write to the mayor about this. Maybe, if enough of you do that, he'll respond. In 2017, the Mayoral Advisory Commission on City Art, Monuments, and Markers was formed. 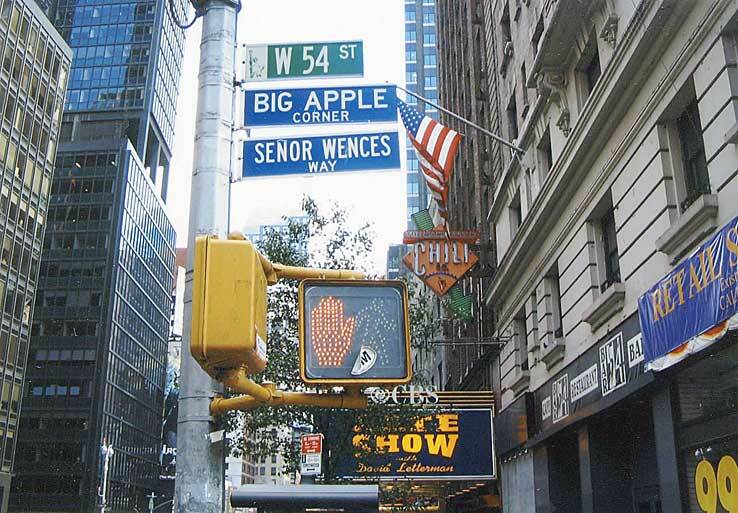 I told the Commission that a “Big Apple Corner” honorary street sign, by itself, was meaningless. I again said that John J. Fitz Gerald’s historic 1924 and 1926 Morning Telegraph “Big Apple” columns should be bronzed and put in the pavement. I also suggested installing new apple-shaped, interactive “history hotspot” sidewalk markers throughout the city. People can read the marker, but they can also point a smartphone at the hotspot and learn the “Big Apple” story in Spanish, Japanese, Hebrew, or whatever language they prefer. I wrote to the New York City Cultural Affairs Commissioner Tom Finkelpearl, who was a co-chair of the Commission. He did not bother to respond.